Systematic incorporation of climate change concerns into formal community planning, management, and infrastructure design is in a nascent stage. Yet innovative climate change and flood management practices are being implemented in every state in the region (North Atlantic U.S.A, Virginia to Maine), and in diverse municipalities with varying demographic and geographic characteristics. The devastation wrought by Superstorm Sandy and Hurricane Irene indicate that communities are still highly vulnerable to coastal hazards and flooding, yet the storms have also created a potential watershed moment regarding willingness to adopt innovative adaptations. 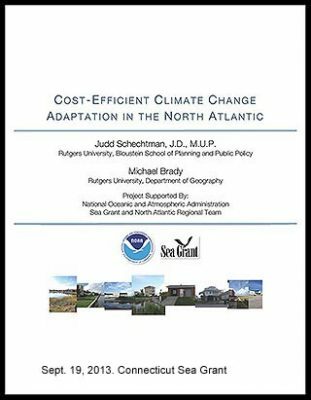 This study was undertaken to raise awareness of the best practices in leading North Atlantic communities. We hope that the results will inspire discussion and action in communities that are now considering how to better protect themselves. This project was sponsored by the National Oceanic and Atmospheric Administration North Atlantic Regional Team and Sea Grant.